Interested in swapping 2.5 inch strips? EDIT: I am going to host another round of this swap! Please head over to Flickr and sign up! I just wanted to put some feelers out there to see if anyone would be interested in participating in a Jelly Roll strip swap. I hosted a small swap for 2.5 inch strips two years ago and figured it might be time to start swapping again! If you might be interested in swapping 2.5 inch strips -- which can be left over from jelly rolls or cut from your stash -- pop on over to the Flickr group, Orphan Jelly Roll Strip Swap, join the group and leave a comment on the "Interested in a new round?" thread. I'm hoping people are interested in participating! Last time was a lot of fun and we were able to give everyone a great variety of strips! I've been working on making more blocks out of my Clover Sunshine bundle to go along with the rest of the QCQAL blocks that I've made. Since some of you have mentioned that you want to make extra blocks too with the fabric you have left, I've linked to the tutorials that I've used to make the blocks. Double Aster block from the Quilter's Cache: This one is so gorgeous! I think that this would be a fun bee/swap block. There is a partial seam in this one, but it's totally worth it. Flower Garden Path from Swim, Bike, Quilt: This one is from the Summer Sampler series from 2011. 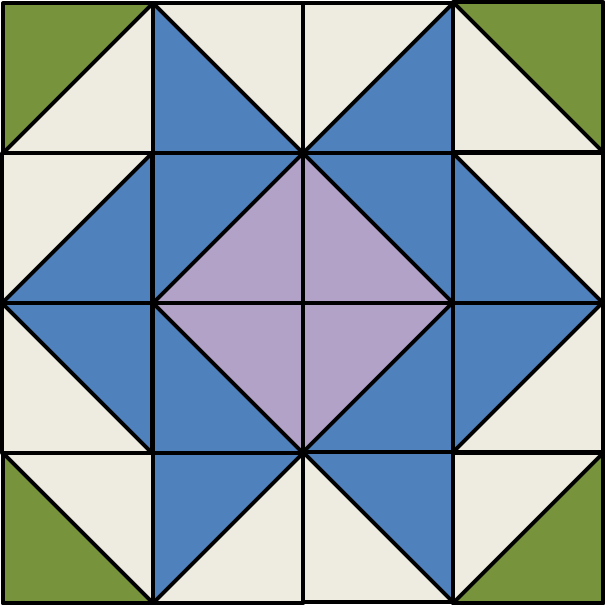 I used the alternate piecing option with the square in the middle instead of using all HSTs. If you don't have big pieces of your focus fabrics, you can use the background in the center. Rocky Mountain Puzzle: I adjusted the size of the strips and the center square to fit the scraps I had, but the rest of it is the same. I was happy to find a 12 inch version since most of them are 8 inch. Star Cluster Block from Judy Martin: I saw this one first on Pinterest and loved it. This block takes some patience because you have to keep your colors in order so that things end up in the right spot. The result is gorgeous! Ohio Star: Classic, quintessential quilt block! Venus Flytrap: This might be an actual real quilt block somewhere, but at this point I'm dealing with small pieces and have just been trying to maximize the fabric I do have left into making a few more blocks. This one is made from 2 1/2 inch HSTs, 2 1/2 inch squares, and one 4 7/8 inch square cut into two triangles. I need to make 2 more blocks and then I will have 24 blocks! Happy Sunday! I've been sort of radio silent this week due to family stuff, a job interview (!!! ), and some sort of the cold/flu relegating me to the couch for the last two days but now I'm finally feeling a little better to start getting caught up posting on my projects. This month's Sew Kitschy block is a crock with utensils! Only one more block to go! This month for my Sew Pieceful Bee blocks, I used the Wampum Block pattern from the Quilter's Cache. I think this is the last month for my peach, mint, and lavender color scheme. I am pretty sure that I have enough blocks. A few are nothing like the colors I requested (so disappointing!) but I think I will use them in a different quilt. I'm thinking about making a "bright pastel" quilt with the ones that don't quite fit into the peach, mint, and lavender scheme and using lots of different colors. Once I get my blocks this month, I'll post a picture of all of my received blocks. Drumroll, please! The last block is a bowtie! Draw diagonal lines on the back of all of your 2 inch squares. Align each with the corner of a 3.5 inch background square as shown. Stitch on the line and trim the seam allowance to 1/4 inch. Press. Lay out each section as shown below. Here's my final 16 blocks! I still have more fabric to use, so I will be making more blocks! Thank you everyone for participating! Come back on Monday for a block link up -- please include a picture of all of the blocks you have made thus far! Here's block #15 -- my modern version of a Friendship Star! Click here for pin-spiration! I decided to design my own block for this one instead of making one large block or four smaller blocks. It's a little bit more modern, and a whole lot of fun. 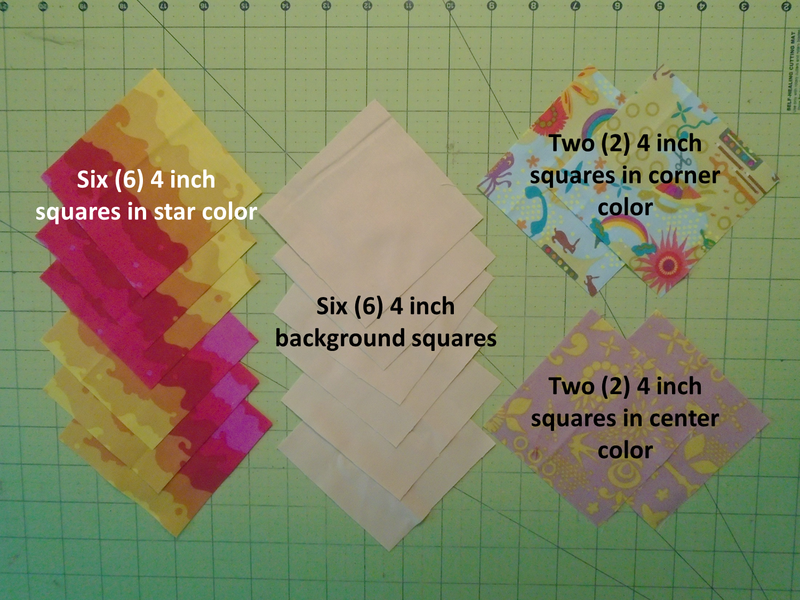 Cut each of your 5 inch squares in half diagonally, yielding 4 background triangles and 4 large star triangles. Set aside one colored and one background for now. 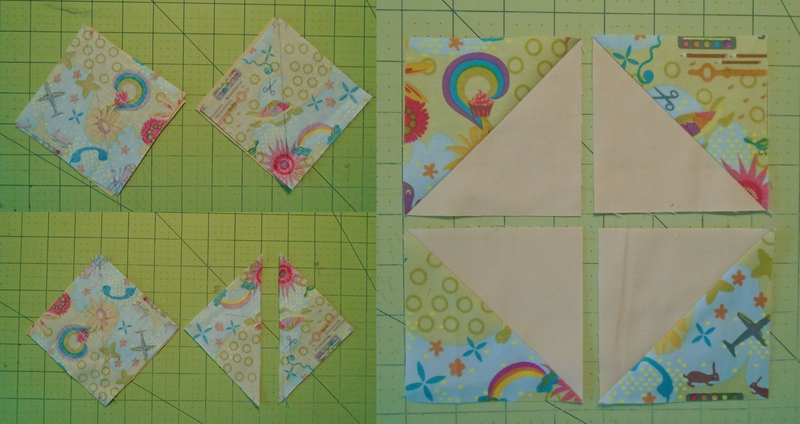 Make 3 HSTs and trim to 4.5 inches. Using the remaining large colored triangle, overlay one of your small square 2.5 inch squares lined up with the square corner. Using the image below as a guide, sew a 1/4 inch seam along the right side of the square. Press over the square and use the large triangle's diagonal as a guide to trim the square. Align your remaining background triangle atop the triangle-square unit. Sew along the diagonal and press. Trim square to 4.5 inches. 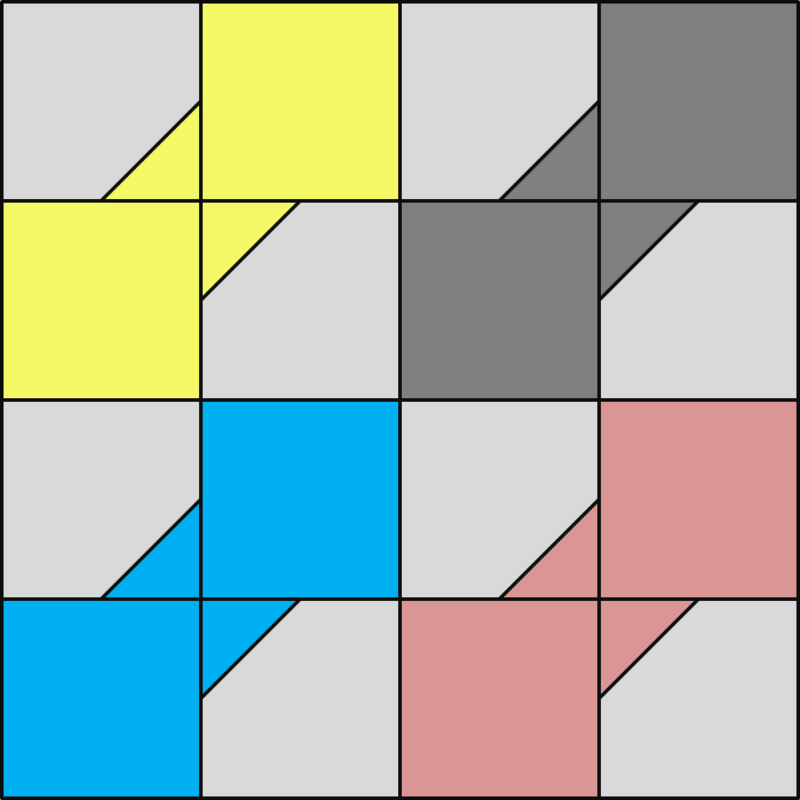 Using one of your three HSTs, draw a diagonal line on one of your 2.5 inch background squares and align it with the colored corner as shown below. Sew on the line, trim the seam allowance to 1/4 inch and press. 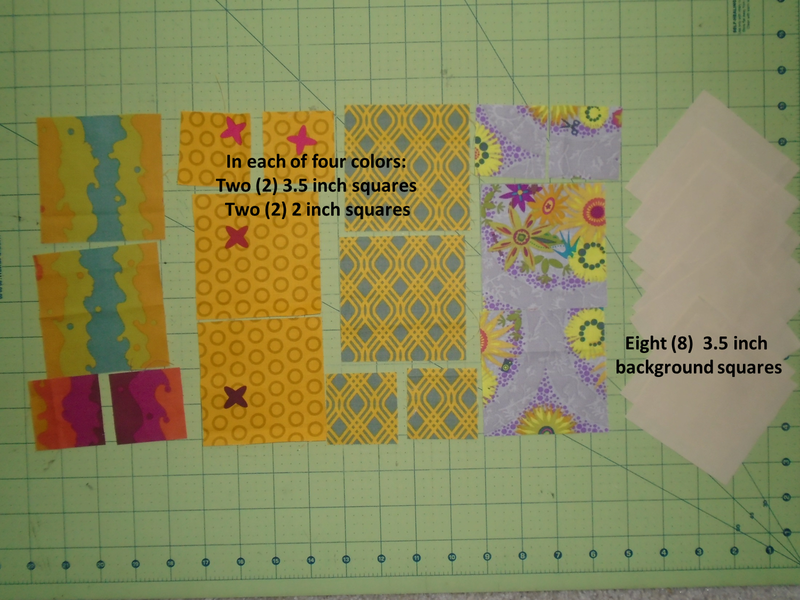 Using your 3 inch squares, make two HSTs and trim to 2.5 inches. 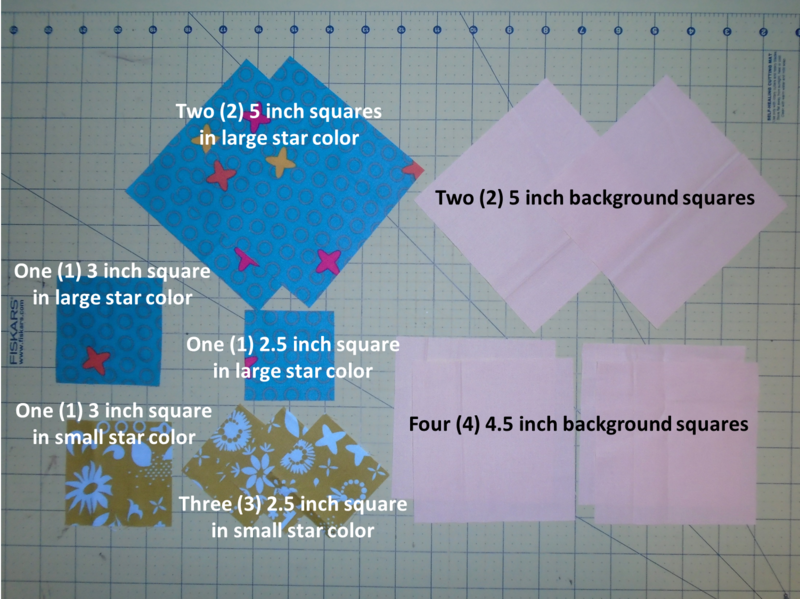 Using your remaining two 2.5 inch squares (one of each color) and your two 2.5 inch HSTs, arrange in the following pattern and sew together. Lay out your units as shown below. Your stitch-and-flip HST unit goes on the bottom, and the triangle/square HST unit goes on the right side. Sew together and your block is finished! Come back tomorrow for our LAST QCQAL block! Don't forget to follow Honey, Bunny, and Doll on Pinterest! It's time for bonus block #2 -- granny square! Click here for pin-spiration! This is a four-ring version similar to the "great granny" block by Lori Holt, as it also uses extended edge pieces to make sure that you have enough room to trim the block to 12.5 inches. This one is a great one to pick out any small scraps you might have left over from other blocks thus far and use them up without cutting into more fabric. Here's the cutting diagram plus the block layout. Sew together squares in diagonal rows. Your longest row should be capped by the 2.5 inch background squares and the shorter rows should each have a 2.5 x 3 inch background rectangle on the end. Iron rows in opposite directions. Sew rows together. Seams of each row should interlock if you alternated the direction you ironed each row. Press connecting seams -- I ironed mine from the center going out. You may want to iron these seams open if you find your block is particularly bulky. 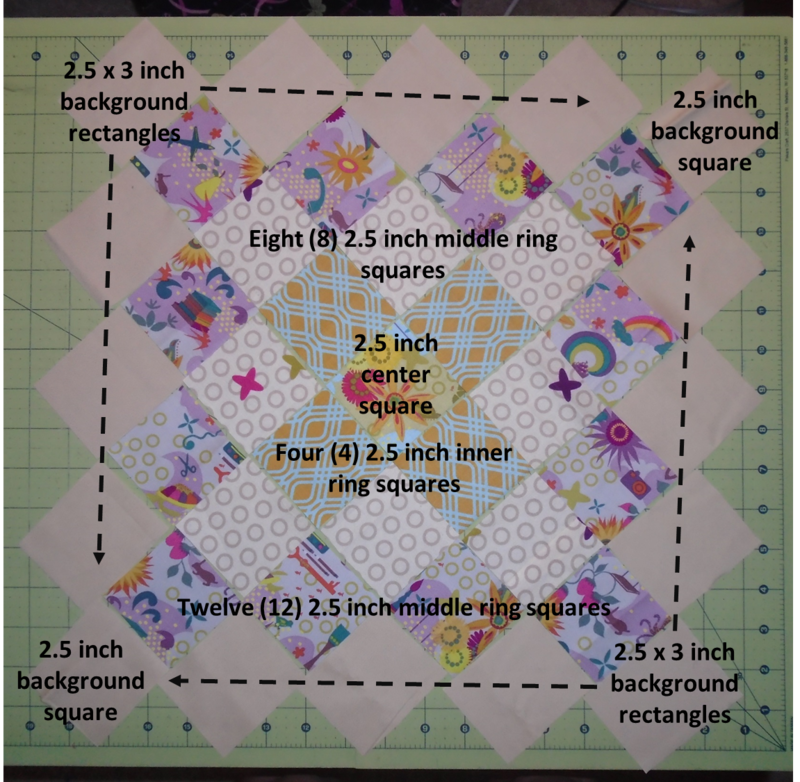 Square up your block to 12.5 inches and voila! You're done! Come back tomorrow for an original HBD designs block as bonus block #15! Our first BONUS BLOCK is the Empire Star! 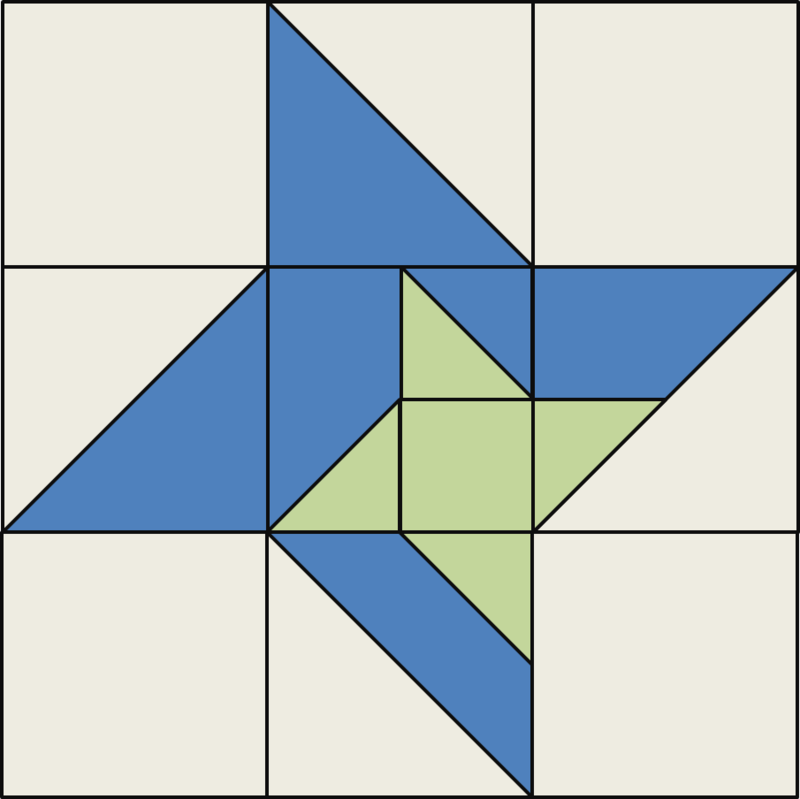 Depending on how you want to color the block, you could alter the pattern to use some fast flying geese or triangles rather than all HSTs. 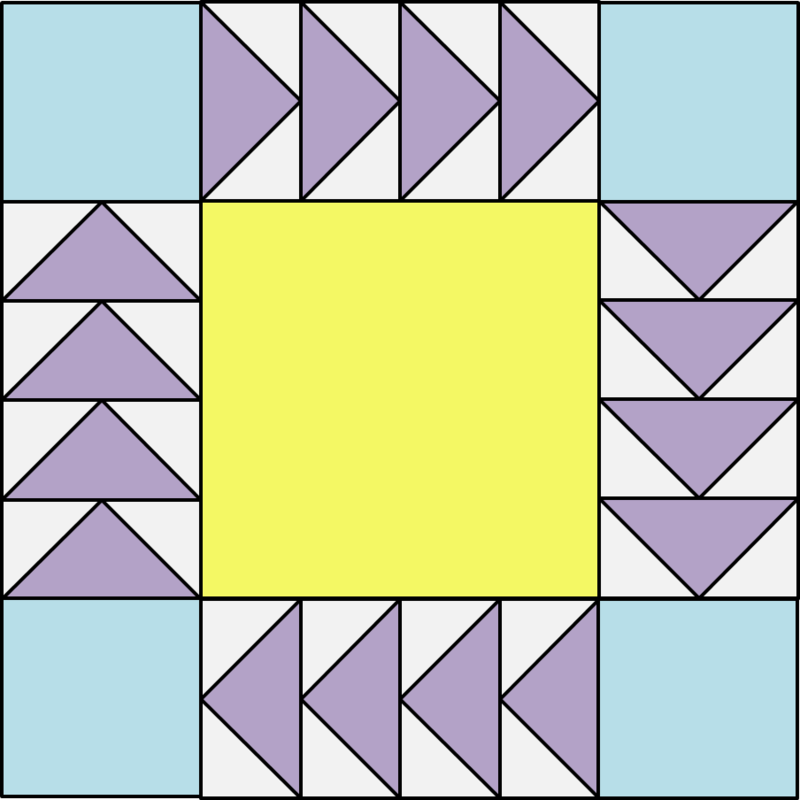 For more color flexibility, this pattern is written for all HSTs. 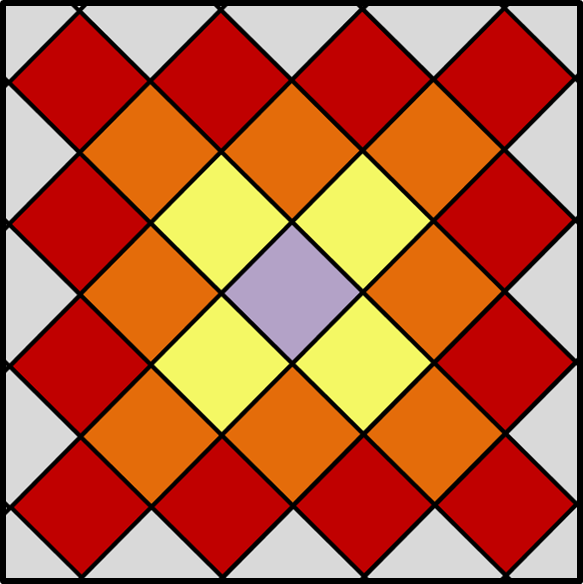 Four (4) star portion color squares with four (4) background squares. For each HST, draw a diagonal line on one square from each of your pairs. Sew 1/4 inch from each side of the drawn line and cut apart on the line. Press and trim to 3.5 inches. Arrange HST units as shown below. Sew into rows and then sew rows together for your final block. Come back tomorrow for bonus block #2! It's time for Block 12 --Wild Goose Chase! Don't forget to come back every day this week for bonus block tutorials! Make as many blocks as you can with whatever fabric you have left! Check out wild goose chase pin-spiration! I made a four color block by alternating the colors of my flying geese. Draw diagonals on all of your 2 3/8 inch background squares. Align two background squares with each of your 4 1/4 inch squares, and sew 1/4 inch from each side of the drawn line. Cut apart and press. Align remaining background squares with corners of partially completed fast flying goose units. Sew 1/4 from each side of the line, cut apart, and press. You will need a total of 16 flying geese, each 2 inches by 3 1/2 inches. Sew your flying geese into four sets of four geese each. Lay out your block as shown below. Sew together for your finished block! No more voting for this QCQAL, just come back every day for a new tutorial this week! I find it a little bit funny that I have yet to make a quilt with bunnies and this month I will be doing just that! My college roommate is having a baby girl this fall and I am working on designing a pattern for a baby bunny quilt. Long time visitors here at LBQ might recognize these as most of the same fabrics that I used in the Cartwheel Baby Quilt (from the pattern by Lee at Freshly Pieced) that I made in Spring 2013. I added in the yellow small medallion print and the tonal green flourish print for this time around. My plan is to alternate between large rail fence blocks and patchy bunny blocks on solid white background (which I need to go buy!). I've just finished making all of the 10.5" rail fence blocks from 2.5" strips cut from all of my prints. My plan is to make checkerboard sections out of all of the scraps and then cut bunny shapes from that and then machine applique it to the background fabric. Has anyone tried appliquing patchwork like this before? Linking up with Freshly Pieced for WIP Wednesday and at ALYoF! It's time again for the Wishes BOM! All of the tutorials are still available so join us! This month's block is called Mrs. Taft's Choice. I'm already seeing that I'm going to end up with a LOT of extra fabric. I think I might try to make the checkered row on the back side bigger and use up more of my fabric or just piece it together for a scrappy back. Check out everyone's blocks in the Flickr group!